Ida Takes Sole Lead in Honinbo League: Two games in the second round of the 70th Honinbo League were played on November 13. Cho U 9P picked up his first win by beating Ryu Shikun 9P (B) by 3.5 points, and Ida Atsushi 8P (B) beat Mimura Tomoyasu 9P by resignation. This was the second win for Ida (right), the previous challenger. Another game was played on November 20. Yo Seiki 7P of the Kansai Ki-in beat Takao Shinji 9P by 8.5 points. That put both players on 1-1. On November 27, the second round was completed when Yamashita Keigo 9P defeated Kono Rin 9P by resig. That took Yamashita to 2-0, giving him a share of the lead with Ida. Kono had made a bad start with 0-2. What could turn out to be the decisive game in the league came in the third round in a clash between Ida and Yamashita. In the previous league, Ida had caught up with Yamashita in the final round, then beaten him in the play-off. This time, in a game played on December 4, Ida (B) beat Yamashita by 1.5 points. Yamashita will have to play catch-up, but forging ahead of the other players didn’t work for him in either the Honinbo or the Meijin League this year. On December 11, Cho U 9P (B) beat Yo Seiki 7P by resignation. 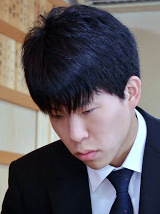 On December 15, Ryu Shikun 9P (B) picked up his first win in the league when he beat Takao Shinji 9P by resignation. On December 18, Kono Rin followed in Ryu’s footsteps by beating Mimura Tomoyasu 9P by resignation. That completed the third round and also the league schedule for this year. The league goes into the new year with a tidy arrangement: the top-ranked player, Ida, leads with 3-0, as mentioned above; the number two and three players, Yamashita and Cho U, are both on 2-1, and the other five players are on 1-2. As yet, no one is out of the running. 4.5 points and Suzuki Ayumi 6P (B) beat Mannami Nao 3P by resignation. On 4-1, Suzuki holds the sole lead — every other player has at least two losses. Iyama Loses Chance for Grand Slam Next Year: Iyama Yuta was eliminated in the quarterfinals of the 53rd Judan tournament, so he lost his chance to aim at a grand slam of the top seven titles in 2015. In a game played at the Osaka headquarters of the Nihon Ki-in on November 28, Kobayashi Satoru 9P beat Iyama by half a point. His prospects subsequently became even more distant, as you’ll see in tomorrow’s report. Suzuki and Rin Win Pair Go Tournament For Married Couples: One of the events commemorating the 90th anniversary of the founding of the Nihon Ki-in was a Pair Go tournament for married couples. There are 16 or 17 professional couples in Japan (I have lost count), of whom eight took part. The first two rounds in the knockout tournament were played on October 6, and the final was held on November 22, which is known as ‘good married couples’ day. If you take the first syllables of the numbers in 11/22 in Japanese, you get ‘ii fufu,’ a homophone for ‘good married couple.’ (Japanese are found of turning numbers into mnemonics). In the final, Suzuki Ayumi 6P and Rin Kanketsu 7P defeated Mimura Kaori 2P and Tomoyasu 9P by resignation. 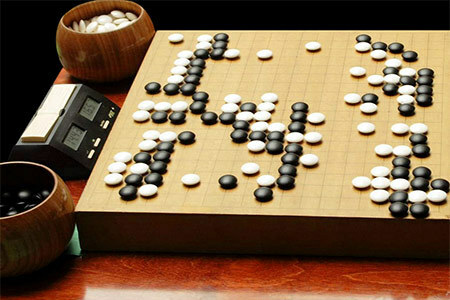 Meijin League Starts: The first game in the 40th Meijin League was played on December 4. Ko Iso 8P beat Hane Naoki 9P by resignation. Two more games were played on the 11th. Kono Rin 9P beat So Yokoku by resignation and Murakawa Daisuke (B) beat Kanazawa Makoto 7P by 13.5 points. Incidentally, Kono’s win ended a losing streak of ten successive games, starting with the fourth game of the Meijin title match (a contrast to his winning streak of 19 games earlier in the year). The final game of the first round was played on Christmas Day. The new Tengen Takao Shinji (B) beat Yamashita Keigo 9P by half a point.